Before we moved to Switzerland, a dear friend asked me to make her a sweater. I was only too happy to oblige. She bought the yarn and chose the pattern herself. I knit a good part of it, then (to my shame) forgot about it as it was buried in a box when we prepared for the move. I suddenly remembered it and dug it out one week and half ago, when this dear friend told me that she had just been diagnosed with a serious illness and the prospects are none too good. Its body was complete, one half of the first sleeve was done, and I set to the task of finishing it. Except I had forgotten what an unpleasant knit it is. There’s nothing wrong with the pattern, which is actually very nice (it’s Beth Silverstein’s Francis Revisited). But there are no words to say how much I loathe the yarn. 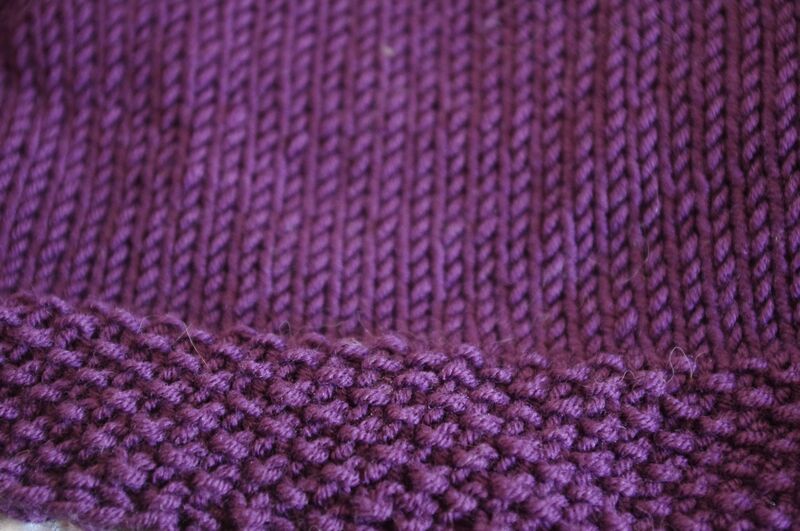 It’s a pretty purple shade, 100% merino wool and should be pleasant to work with. It definitely isn’t. For some reason, knitting this yarn on 6mm needles is almost physically painful, a slow, laborious process. I hate the feel of it. Then it’s the most unforgiving yarn I’ve ever worked with. Every single imperfection, no matter how small, shows. For example, my cat got one of her claws caught in a stitch. She freed herself at once. On most of yarns, there wouldn’t have been a single trace of it (and I know that from experience !). Here ? It made a big mess. Near the neckline of a top-down sweater. And I really, really don’t want to frog and start all over again. Joining balls is a huge problem. I’ve tried about every method I could find on the Internet, and everything – absolutely everything, even my to-go, usually nice and clean solution of knitting both ends together over a few stitches – shows and creates very noticeable irregularities in the plain stockinette texture. To make things worse (as if they needed to), I don’t have DPNs in this needle size, so I’m knitting the sleeves on two circulars, and the dangling ends bother me to no end. It’s full of imperfections, but there is no way I go back and try to fix them. The only reason I’m going on is because it’s for my friend. I clench my teeth and visualize her face ; that’s the only way I can persevere with this project. Were it intended for me, I’d have yielded to my impulse and thrown it out of the window a long time ago (or maybe, more sensibly, frogged it and donated the yarn to someone who would have liked it better than I do). My husband complained a few days ago that I had yet to cast on the yarn I bought to make him a vest. I can’t. If I want to finish this, then I have to knit nothing else until it is, at long last, done and I’m free. I’m yearning to get back to my green thing, or to bury myself in the soft, cuddly, warm grey yarn waiting to be turned into my husband’s vest. But if I do so, then my friend’s sweater will probably fall for ever into voluntary oblivion. So I knit on. One more sleeve and the collar to go. Edit : This sweater really decided to make my crazy. I’m picking up the stitches for the second sleeve, and the total of stitches is different from the first one. Nothing’s right about this project. This entry was posted in Knitting and tagged frustration by Julie Paik. Bookmark the permalink.